7 days, 6 nights – wonderful North-east 7 days motorbiking. Day 1: Hanoi – Na Khan. ~180 km, ~8 h.
In fact, today’s ride is a quite a long ride but easy (so early departure is better) from Hanoi to Na Khan 180 km. In general, the road is sealed all the way until Bac Kan. However, the last part from Bac Kan to Na Khan is wild and little bumpy. Na Khan is a Tay village, lost in the middle of the primitive forest. Mr. Lo, the chief of the village will welcome us in his house. Day 2: Na Khan – Ba Be. ~50 km, ~2 h.
A short drive from Na Khan to Ba Be on a bumpy road. Then we enjoy lunch at our captain’s house (Mr. Dang, we call him Zi Dang. Regrettably, he passed away in 2009 but his son will continue his business). Easy boating on the lake and river. Go to market (if it is the day you arrive). Stop at a waterfall, beautiful swim etc. Ong pirate, the chief of Dau Dang waterfall where we enjoy dinner. Down the waterfall, we could visit the village and a small school (only a few pupils during the summer). Finally, spend the night in a stilt house of forest guards or our captain’s house. Day 3: Ba Be – Quang Hoa. ~170 km, ~8 h.
Day 4: Quang Hoa – Ban Gioc – Quang Hoa. ~100 km, ~2 h.
Day 5: Quang Hoa – Na Tau – Quang Hoa. ~30 km, ~1 h.
Day 6: Quang Hoa – Mau Son. ~180 km, ~6 h.
Ride from Quang Hoa to Lang Son on the scenic and historic Highway 4. Then continue riding toward the border from Lang Son to Mau Son. Mau Son is 30 km away from Lang Son, 1.541m above sea level. Quite cool in the evening! Night in the guest-house of Mau Son Resort. Recently, we received some complaints about room service and prostitution in Mau Son. In case you want better hotel rooms, we could stop in Lang Son city or Bac Son Valley further back on Highway 4. Day 7: Mau Son – Hanoi. ~180 km, ~4 h.
Promenade around Mau Son in the morning. Then ride down to Lang Son to have lunch. In general, the road is asphalted all the way and it takes 3 and half hours to drive back to Hanoi. We arrive in Hanoi around 3 to 4pm, before rush hours. Contact us now to book this tour or to know about different itineraries and options of this wonderful North-east 7 days motorbiking in Vietnam. 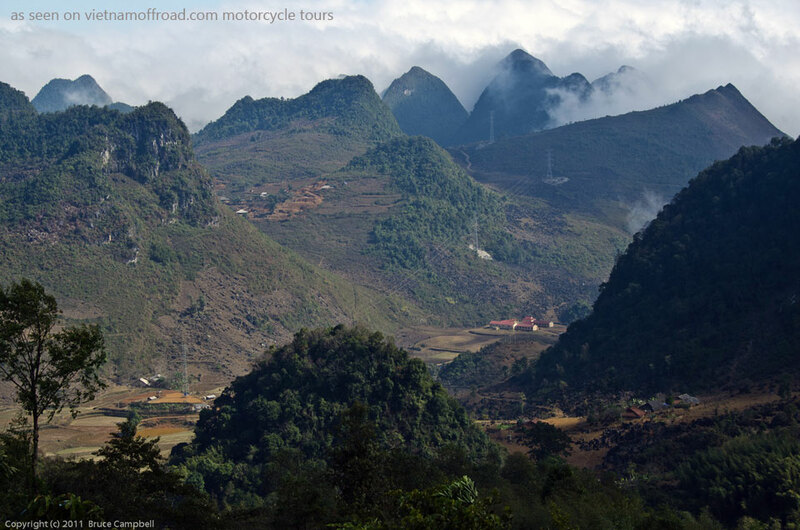 Below is a video clip that has some portions of this wonderful North-east 7 days motorbiking of Vietnam. In case you want to watch more videos of our Vietnam motorbike tours please check our YouTube channel.